Small heterogeneous creatures appear real before we even fully consider what to call them. 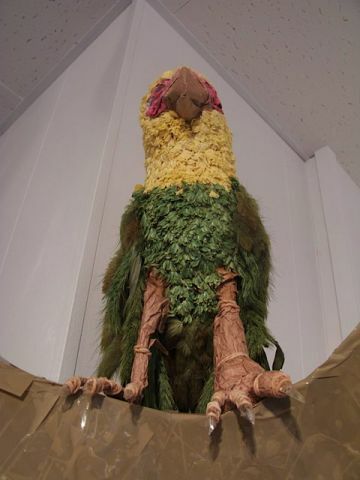 Created from contorted paper, cotton and plant parts, a family or gang of bird-like beasts have been attacked and are splashed across the floorboards of the Wasp Room gallery. Beaked entrails rest disastrously upon the floor; it appears that they have been violently expelled from their eggs – which also lay scattered about – then disjointed and killed. The rather obvious and most notable part of the show explodes from the farthest wall. 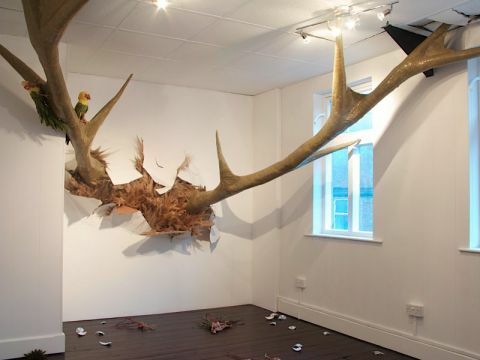 It appears that a much larger beast, some sort of antlered bovine has charged at the gallery and ruptured through the wall. Two huge antlers impose themselves across the room, emerging from the hole they have burst through the furry surface of this beast is exposed. The antlers are constructed from cardboard encased tightly under a layer of parcel tape leaving them smooth and polished. The broken flaps of the wall are painted on the top, but admit their falsity by making no attempt to hide their cardboard undersides. The hair around the base of these antlers is assembled from pampas grass; I imagine these antlers to be a small section of what is the giant head, or the clawed foot of some huge monster. These protrusions arch across the space and have followed right through to the ceiling tiles, breaking these also. Anticipation of further violence is temporarily postponed, albeit briefly; this beast would need to retreat, before it could charge at the gallery again; it humorously appears to be stuck. But for the time being we are presented unarguably with an aftermath. Upon a second viewing, the smooth pronged protrusions sidestepped away from an act of violence when I noticed that the hole these aggressors appear to have burst through isn’t nearly wide enough for them to fit through. The wall is only splintered around the immediate area of their bases and they spread out far wider than this. Two birds seem to be waiting on one of these branches. Is it actually a plant? Have these arms grown out of the wall instead of violently bursting through it? And are these two squatting acidic coloured brutes actually those responsible for this massacre? In comparison to the now rather friendly antler like parcel-tape tree branches, it seems likely that these birds are the guilty party for this assault. The exhibition plays with time – incidentally an obvious factor in the creation of these detailed fiddly pieces. The antler-branches have either grown over a great length of time, or they have burst through the wall very suddenly, the ambiguity of this immediacy is what keeps this show freshly exciting. The eggshells are made from a collection of white, blue and black hole-punched circles, layered decoratively upon each other forming the spotty broken pieces. The bird entrails are formed from stringy leaves and other sinewy fibres. Their heads have no eyes, perhaps gouged out? It is not obvious which heads go with which of the legs; we can see that these birds won’t be put back together again. The narratives Trouble In Paradise inspires are varied yet always drawn back to creatures having been violent with one another for seemingly little reason. These attackers are childlike and bemused with what they have done. It is this implied yet contradicting nature of the narrative that I find most interesting. Swann manages to get us to do a lot of work as viewers both in working out what has happened and in working out how her creations have been made. The lack of any bird-nest from the show retains ambiguities; this along with other narrative gaps allows us room to imagine events, rather than being didactically told a story.